The Invaders - Audiobook | Listen Instantly! Approximately 200,000 years ago, as modern humans began to radiate out from their evolutionary birthplace in Africa, Neanderthals were already thriving in Europe—descendants of a much earlier migration of the African genus Homo. But when modern humans eventually made their way to Europe 45,000 years ago, Neanderthals suddenly vanished. Ever since the first Neanderthal bones were identified in 1856, scientists have been vexed by the question, why did modern humans survive while their evolutionary cousins went extinct? The Invaders musters compelling evidence to show that the major factor in the Neanderthals' demise was direct competition with newly arriving humans. 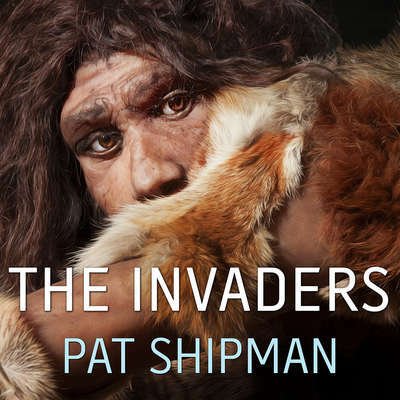 Drawing on insights from the field of invasion biology, Pat Shipman traces the devastating impact of a growing human population: reduction of Neanderthals' geographic range, isolation into small groups, and loss of genetic diversity. But modern humans were not the only invaders who competed with Neanderthals for big game. Shipman reveals fascinating confirmation of humans' partnership with the first domesticated wolf-dogs soon after Neanderthals first began to disappear. This alliance between two predator species, she hypothesizes, made possible an unprecedented degree of success in hunting large Ice Age mammals—a distinct and ultimately decisive advantage for humans over Neanderthals at a time when climate change made both groups vulnerable. Download and start listening now! Pat Shipman is an anthropologist and a retired adjunct professor of anthropology at Pennsylvania State University. She is the author of several books, including The Animal Connection, The Man Who Found the Missing Link, and Taking Wing, which won the Phi Beta Kappa Award in Science and was a finalist for the Los Angeles Times Book Prize.